1. To make the passion fruit curd, place the eggs with the egg yolks, sugar, passion fruit and lemon juice in a pan over a medium heat, and cook, stirring continuously, for 2 minutes or until the sugar dissolves. Gradually add the butter, stirring, until melted. Reduce the heat to low and cook, stirring for a further 2-3 minutes or until the mixture coats the back of a spoon. Immediately pour into a shallow dish and refrigerate for 2-3 hours or until set. 2. To make the raspberry jam, purée the raspberries with a stick blender, strain and discard the seeds. Pour the seedless purée into a pan and stir in the sugar. Over a medium heat bring to the boil and simmer, stirring occasionally, for 7-8 minutes or until the jam reaches 99°C. Remove from the heat and allow to cool completely. 3. To make the Italian meringues, preheat oven to 150°C, gas mark 2. Place the egg whites and cream of tartar into the bowl of a stand mixer, and whisk on a medium-high speed until soft peaks form. 4. Combine the sugar with 125ml water in a small pan over high heat, stirring until the sugar dissolves (use a wet brush to wipe down the sides of the pan). Bring to the boil. Insert a thermometer and bring to 121°C. Remove from the heat and allow to cool to 117°C, then slowly pour into the egg whites, whisking constantly. Once all the syrup has been incorporated, whisk for a further 5 minutes, until thick and glossy. Spoon the mixture onto 2 baking trays lined with baking parchment, making 6 individual meringues, and smooth the tops with a palette knife. 5. Top each meringue with 1 tsp raspberry jam and use a skewer to swirl this through the meringue. Turn the oven down to 120°C, gas mark ½, and bake for 10 minutes. Turn off the oven and leave to cool completely. 6. Finally, whisk the cream with the vanilla bean paste. Place a spoonful of the vanilla bean cream into the centre of each meringue. 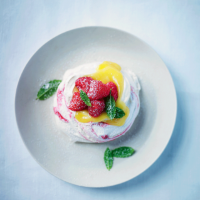 Add a spoonful of the passion fruit curd and top with 5-6 fresh raspberries and a scattering of small mint leaves. Serve with the remaining raspberry jam and passion fruit curd, or store chilled in the fridge for up to 3 days.